As shown in fig. 1-31, the residual pressure continues to act for some time after 0.00500 second and therefore the final velocity reached by the bolt can be considers ly higher than the 12.5 (ft./scc.) average value allowable for the first 0.00166 second after the bolt is unlocked. 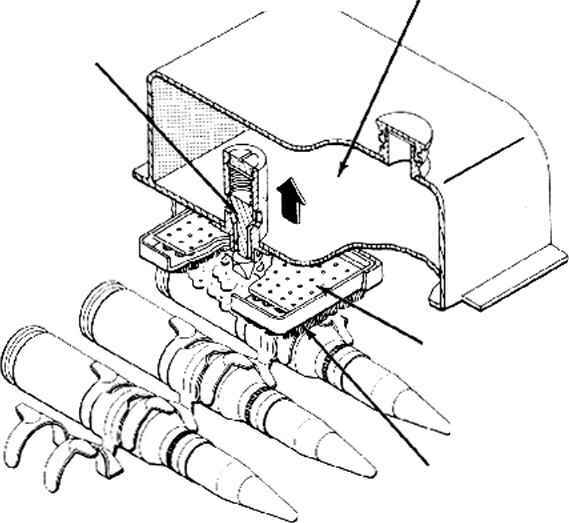 The foregoing considerations show that the use of delayed blowback permits the attainment of relatively high bolt velocities with conventional ammunition so that it is not necessary to use the special ammunition described for advanced primer ignition. When delayed blowback is used, only a very small portion of the total impulse of the propellant explosion is available for operating the gun mechanism. The relative magnitude of the available portion of the total impulse can be visualized by-examining fig. 1-32, which shows the variation of the chamber pressure with time. Assuming that the bolt is unlocked 0.001 second after the projectile leaves the muzzle, the shaded area in this figure (when multiplied by the bore cross-section area) would represent the impulse which produces the relative velocity between the bolt and the barrel. The unshaded area under the curve (also multiplied by the bore cross-section area) would represent the impulse applied to the barrel and bolt while these parts are locked together. necessary to mount the barrel so that it can recoil to the rear and thus provide a means for controlling the magnitude of the trunnion reaction.